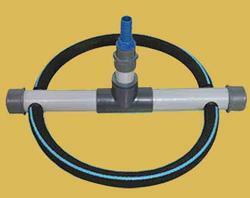 Aeration System is used for aeration for waste water treatment. They are very simple and sturdy. Its upwardly convex dish is covered with the EPDM Membranes, which encompassed the rim of the dish and perforate. They have a capability to work for a long time. They are used for Die Cutting. They are mounted with the Stainless Steel. They are very light in weight and easy for maintenance. We are counted amongst the leading firms in the industry, offering a technically advanced array of Tube Diffuser. Our entire product range is quality approved and can be easily installed. Our entire product range is well-tested on varied parameters thereby delivering an exceptional product line. We are supplying of fine bubble Air Diffuser in diffrent size and type. 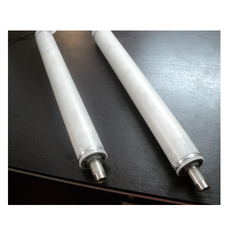 We are Offering Aeration Tube for aeration system, it uses in waste water treatment like STP, ETP, fish farming, Aquaculture etc. to our client. 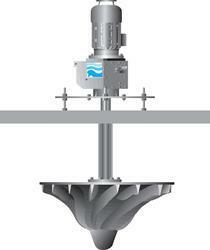 Impeller : The Aerator Impeller is provided with radial self cleaning blades, design to give optimum oxygen transfer in to liquid. The turbulance created by the impeller is sufficient to keep the sludge in suspension at the farthest point. The impeller is M.S. 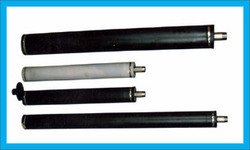 Construction with tubular shaft design for required torsional capacity. The wetted parts is suitable for withstanding The corrosive action of the liquid. The important aspect of the design of the impeller is a self-cleaning built in feature, which requires absolutely no maintenance of the impeller, since no range and other solids can gets caught within the Impeller vanes. The impeller is balanced statically. Shaft : Is of M.S. PIPE (Heavy duty) having concentrically machined flanges to connect gear box and motor assembly through rigid heavy-duty coupling. 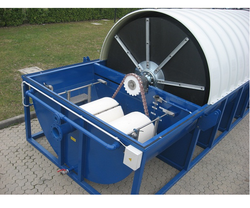 Drive : The aerator of PP Aquatech is driven by motor of suitable rating. The speed is reduced from the motor speed to the aerator speed by a suitable reduction gear box. Having worm/helical gears, the speed of the aerator and the diameter of impeller are so selected that aerator will have the optimum oxygen transfer capacity of 2.0 KG/KW/HR. The motor is of reputed make suitable of outdoor duties. The reducer bearings and gears are oil lubricated. We are a manufacturer & supplier of bio rotatoer contractor. Bio-Rotator is an extremely efficient secondary biological wastewater treatment system. It utilizes aerobic fixed film technology to reduce organic matter (BOD5), total suspended solids (TSS), ammonia and phosphorous from domestic and industrial wastewater, achieving a high quality final effluent that is safe for discharge. Tested Technology. Bio-Rotator is capable of treating a wide range of flows without compromising effluent quality and able to handle overloading for short periods of time. Easy and Immediate Start-up. The system is designed to be a complete wastewater treatment plant. Because it is preassembled, the system’s start-up requires minimal technical experience and wastewater treatment can begin immediately. Low Operating Cost. Our RBC system has very low energy consumption and little skill is required in plant operation. Low Maintenance Cost. Stable operation without frequent supervision. It only requires drive and bearings lubrication and bi-annual sludge removal. Continual monitoring of the wastewater quality is not necessary. Inoffensive and Unobtrusive. Because Napier-Reid’s Bio-Rotor™ is virtually silent and odour free, it can be placed near public places. And when supplied with the optional FRP cover, it gives the system a low profile that is aesthetically pleasing in any environment. Environmentally Friendly. Bio-Rotator is energy efficient and does not use toxic chemicals that can harm the environment. The effluent produced is clean and safe enough to discharge directly to surface watercourses or subsurface tile beds. Flexibility and Sustainability. Additional systems can be installed in parallel to increase the total capacity as population grows. The process consists of corrugated plastic media arranged around a horizontal shaft, placed in a tank. The media is slowly rotated. 41% of the media surface area is submerged in wastewater. Organisms in the wastewater attach and multiply on the rotating media until they form a thin layer of biomass. This fixed film growth presents a large, active population for the biological degradation of organic pollutants. Whilst rotating, the media transports biomass and wastewater into the air and oxygen is absorbed. The wastewater contains dissolved oxygen and organic materials which are then diffused into the biomass and metabolized. Continuous growth of the biomass is allowed via the corrugated media which allows wastewater and air throughout the surface area. Depending on temperature, organic loading, and other variables, the biomass thickness can vary. As the media rotates, excess biomass shears off at a steady rate, allowing for a stable process with minimal operator input. The sheared off biomass flows through the RBC system for removal in a final clarifier. Nitrification:When the proper influent environmental conditions exist within the wastewater such as alkalinity, temperature, low BOD, and ph, the reduction of ammonia nitrogen can be easily achieved. Ammonia nitrogen values can be reduced to up to less than 1.0 mg/l. Package Wastewater Treatment Plant: PP AQUATECH Package Bio-Rotator RBC plants combine separate processes (as required): bio contact, secondary clarification, tertiary filtration, and disinfection – into one complete unit, and are generally provided for small and medium population ranges. Benifites: Consistent process results,Stable operation without frequent supervision,Lower expansion and retrofit costs due to modular construction and reduced excavation,Short wastewater retention time allows for a smaller foot print,Low energy consumption, Simple operation: no recycle, less lab testing for process control.